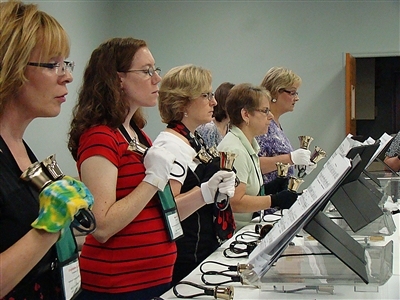 Participants in the advanced handbell class at the Florida Fellowship of United Methodists in Music and Worship Arts workshop take on some challenging music under the direction of Sondra Tucker. Photos by Susan Green. 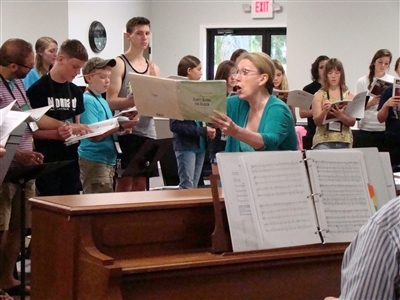 FRUITLAND PARK – The choir house rules aren’t formally listed on a wall, but participants learn them pretty fast in one of Dr. Carol Krueger’s clinics. No smiles upon the lips, only in the eyes. Oh, and about those Rs: They’re for speech, not song. If you sing an “r,” you’d better be rolling it. 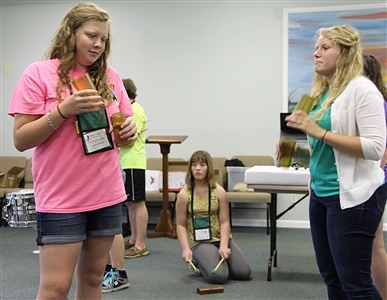 “I need you in front of the mirror tonight, practicing,” warned Krueger, as she coached middle and high school students at a weeklong workshop offered by the Florida chapter of the Fellowship of United Methodists in Music and Worship Arts. Krueger’s choir members were among more than 100 adults and youngsters to attend the 58th annual workshop, held at the Florida Conference’s Life Enrichment Center (LEC). Music directors and choir members from United Methodist, Presbyterian and Episcopal churches across the state worked to polish musical pieces for performance before family and friends at the end of the week. Dr. Carol Krueger encourages youth choir members to note some inflections in their music to create a better sound. 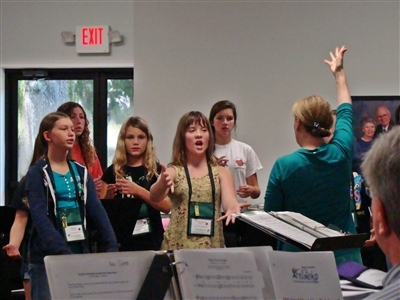 Youth choir members respond to director Carol Krueger's coaching at the Florida Fellowship's annual church music workshop. Young participants in the Florida Fellowship church music workshop unwind by striking a rhythm with everyday items like cups and sticks. In addition to choral singing, sessions focused on handbells, percussion, guitars, dance and other forms of worship through expressive arts. Krueger, choral activities director at Emporia State University in Kansas, was one of three nationally known clinicians to help musicians hone their skills at the workshop. Others were Sondra Tucker of Memphis, Tenn., handbell editor for Alfred Publications, and Dr. David Cherwien of Minneapolis, music director of the National Lutheran Choir. All stressed the importance of warmups, posture, breathing and attention to the body as well as the soul. Singing is not for sissies, and that goes for handbells, too. Moving an audience to a closer relationship with Jesus takes more than getting the words and notes right, participants were told. Energy, dynamics and practice play key roles. “My Christ wants me to be the best that I can be,” Krueger told the young crooners gathered around her in the Pearson Building at the LEC. Those are lessons that translate well for life, said Lorraine Miklos, who was chaperoning young people from Christ Presbyterian Church in Ormond Beach. “By the end of the week, they’ve learned that hard work pays off, and then they can put that [concept] into anything,” Miklos said. Joan FitzGerald, Florida fellowship president, said people who attend the workshop, including children and teens, tend to come back for more. Joyce Dawson, retired music director of Christ Presbyterian, said she has been attending the workshop for 34 years. Trained as a registered nurse, she answered a call to lead musical worship at her church with no formal background in the field and she saw the fellowship as a lifeline. “It’s one of the biggest blessings in my life,” said Dawson, who estimates she has introduced about 120 young people to the event over the years. Dawson and others rattled off stories of young people who found their calling through the workshop and went on to pursue careers in ministry, music or both. “What starts here is kind of like a ripple effect down through the ages,” Dawson said. Karen Forrester of First UMC in Bainbridge, Ga., credited the workshop with inspiring a desire in her son, now 22, to become a worship leader. She said the friendly atmosphere and setting of the Florida workshop keep adults and children from her church coming back. 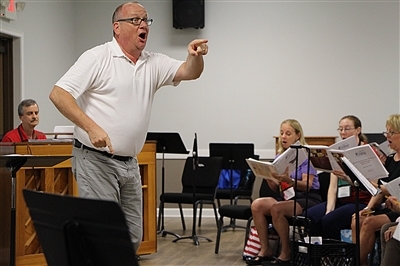 When the church first decided to invest in improving its music ministry a few years ago, participants tried a training event at the Lake Junaluska retreat center, the hub of the Southeastern Jurisdiction for The United Methodist Church. Dr. David Cherwien directs the tenor section of the adult choir to start singing during a rehearsal of "Ain't That Good News" at the Florida Fellowship of United Methodists in Music and Worship Arts workshop. Hayley Welsh, 11, who came with the Christ Presbyterian group, said the rural, woodsy setting of the Life Enrichment Center helps foster a deeper spiritual experience. Blake Justice, 12, and Rosie Pena, 11, also from Christ Presbyterian, said getting away from the everyday hubbub of life improves concentration and inspires a better performance. “I really like how it’s in the wilderness, and you can see all the beautiful stuff God has made for you to live in,” Rosie said. In addition to music workshops, the event featured worship led by Revs. Chris Sanders and Charissa Jaeger-Sanders of Christ UMC, Neptune Beach. Jaeger-Sanders, an ordained deacon, is the founder of Grace Works Studio, a ministry that helps people connect with God through artistic expression. FitzGerald said the fellowship is funded through proceeds from the workshop and other donations. The Florida chapter is the largest and one of the oldest in the national Fellowship of United Methodists in Music and Worship Arts. For information on the Florida chapter, visit www.floridafellowship.org or contact FitzGerald at half_note@verizon.net. Check out the videos below for a sampling of rehearsals, worship and other activities at the workshop. Below, Dr. David Cherwien directs the adult choir in a rehearsal of "Standing in the Need of Prayer." Videos by Susan Green, edited by Don Youngs.